Make Bacon Cinnamon Rolls in a pie iron on your next camping trip. This sweet and savory pastry is fun and easy to make. Hi, I am Diana and I run a camping blog called Let’s Camp S’morewith my husband, Eric. Our blog features camping recipes, DIY, tips, hacks and more. 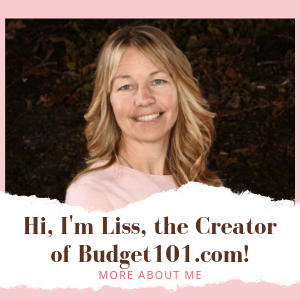 We are excited to be guest bloggers here at Budget101™. One of our favorite things about camping is the food. It seems that just about everything tastes better made over the campfire. Breakfast is no exception to this. We tend to do all of our cooking while camping. We do not go out to restaurants very often. This includes the camping vacations that we take each year. Most people probably stay in a hotel or condominium, but we tow our pop-up camper around the Midwest and enjoy all the sight and sounds. I do all of the meal planning and grocery shopping for camping, but Eric does all of the cooking. He is particularly good at making breakfast. He also does all of the dishes when we camp. He is a keeping, for sure. Recently, we made a giant cinnamon roll out of cans of refrigerated cinnamon rolls. This involved unrolling the cinnamon rolls to create a big one. This process got us thinking about things we could roll into the cinnamon rolls, and we came up with bacon. This simple recipe requires to ingredients: bacon and a can of refrigerated cinnamon rolls. You will also need a pie ironand some parchment paper. You start this recipe out by opening the can of refrigerated cinnamon rolls. Separate each roll and place the icing off to the side. Take an individual cinnamon roll and unroll it. Play a single piece of bacon on top of the unrolled cinnamon roll. Amazingly, a piece of bacon is the same length as the unrolled cinnamon roll. Carefully roll the cinnamon roll back up with the bacon inside. Cut out to pieces of parchment paper to fit inside your pie iron. The parchment paper can be reused a few times. Place the bacon cinnamon roll between the two pieces of parchment paper inside your pie iron. Close and clip your pie iron. Place the pie iron over the hot coals from a campfire. Cook 8-12 minutes per side, depending on the heat of the fire. Carefully open the pie iron to see if the cinnamon roll is baked. Bake longer if necessary. We placed the very first cinnamon roll we made down in the coals of the fire. We used our usual sniff test to see if they were done. All of a sudden, we smelled burned cinnamon. We opened up the pie iron and discovered a completely black and burned spiral. I guess the fire was too hot! When the cinnamon rolls and bacon are fully cooked, carefully remove from your pie iron and place on a paper plate. Snip the corner of the icing packet in drizzle icing over all of the cooked cinnamon rolls. Eat and enjoy! These bacon cinnamon rolls are very tasty. While they are intended for breakfast, they make a hearty snack! Eric made eggs to go with these rolls so we got full very quickly. We shared the cinnamon rolls with some camping neighbors. They really enjoyed them. This recipe would be easy to make at home. Roll them out the according to the directions of this post, but place them in a pan and bake according to package directions. You will need to extend the baking time to make sure the bacon is fully cooked.